Bryan Forbes in GTA Vice City Stories. 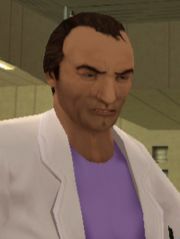 Bryan Forbes is an undercover agent for the DEA in Grand Theft Auto: Vice City Stories. He is just a new employer for Victor and Lance Vance when he provides missions for them, and aids Victor on his rise in power in Vice City. His white suit and pink shirt resemble those of Sonny Crockett from the 1980s Miami Vice television series. His suit also shares the same color with Lance's outfit in Vice City. Lance soon finds out that he is an undercover cop, and he and Victor capture him and take him to an abandoned building where they tie him up and get some info from him. He is killed by Victor when he tries to escape after duping Lance and Victor into entering a gay white supremacist bar, Lance did not have any intention of killing him because he did not yet reveal where a big cocaine shipment was, however Lance learns that Jerry Martinez will be receiving the shipment. Later on, in the mission The Mugshot Longshot, Lance uses Forbes's ID card to prove to Armando Mendez that Jerry Martinez tried to steal Mendez's Cocaine. He sticks Martinez's photo onto Forbes's ID card to fabricate that Martinez is an FBI agent. The official GTA Vice City Stories website features a news report with pictures of a man in the same suit with his face blurred. The news report mentions an undercover FBI agent named "Agent BF", leading some to believe that the man in the picture is indeed Bryan Forbes. Bryan was voiced by Daniel Oreskes. Forbes captured by Lance and Victor Vance. Jenny Mitchell: "MeTV News has been speaking to an undercover FBI agent about the problems currently facing Vice City. Agent BF, who spoke to us off the record on the condition we protected his anonymity, told us the situation in Vice City is now completely out of control." This page was last modified on 22 April 2014, at 18:12.